First of all, I come with an apology: I haven't been around an awful lot lately. I managed to get a freaking virus on Sunday night, of all nights, and I couldn't make it to the computer yesterday. The other two days I had off last week were just me being lazy. Seriously, it isn't good. Anyway, because of that virus, I'm taking it easy on the movies tonight, with only The Amazing Spider-Man to keep me company for the night. I do hope to be watching Attack the Block (finally it's coming out in NZ, after 50 billion years) tomorrow night. And then we're heading into November, which means The Dark Knight Rises trailer will be at work making everything better in my life!!!!! I haven't done one of these links posts in ages so I haven't had a chance to just highlight how awesome the Zero Dark Thirty official trailer is. It has so much Jessica Chastain (but not so much of her speaking). New most anticipated film for 2013 (since it is only getting a small release in 2012 to be eligible for Oscar stuffs)? I think so. Everyone has to stop what they're doing, because Tyler is back blogging at Southern Vision. Plus, his return to blogging is centred on the "Directorial Perfection" of Hunger. Alex takes a look at the career of writer/director/actor Edward Burns, who I've always wanted to see more of. Such a great guide on the guy! Ryan ponders over the power of star ratings. It is a well-worn debate, but he definitely brings some ideas to the table. Andy got to interview Paul Thomas Anderson (needless to say, I'm VERY jealous), and here is the outcome. PTA sounds like a very interesting guy. Earlier this year I went and saw a one-man play called Private Peaceful, which was a fantastic experience. Now there's a movie out based on the novel by Michael Morpurgo (with more than one person acting it out), and Diana got to see it. Anna has a review of the very scary Freaks. Seriously, I don't think I could ever stomach that film again. Love a bit of Hollywood Memorabilia? I know I do. Here's a comprehensive site filled with all sorts. Who is one director you'd really like to interview? I dunno if there will be a point in me trying to interview Woody Allen or Tarantino or Fincher because I will probably just end up drooling and going "I love you and your work" every five seconds. Have fun with Spidey *snort* (I can see an Andrew Garfield crush coming back for you in near future). Haha, that would be me with Christopher Nolan. And yes, I'm in love with Andrew Garfield again. He's so beautiful in that movie. Haha, you best get learning then! I hope you'll like Amazing Spiderman more than I did, I thought it was one awful movie. Thank God for Emma Stone, if it wasn't for her I would not be able to finish it. I thought it was alright, but Andrew Garfield and Emma Stone were the highlight. That's a good idea. Darren Aronofsky would be really interesting to interview! Thanks for the link - I seem to be becoming a fixture around here. In recording the next Matineecast last night, I actually had to crack a smile when time came to give the film discussed a rating, since it seemed to run counter to that very popular post! Haha, how ironic. Oh well, I don't think we can ever escape the ratings. A director I'd really like to interview? Well, considering many of my favorite directors have passed on, it might be hard to choose someone. But thinking it over, interviewing Martin Scorsese would be awesome. He's the kind of guy who could talk about film all day and I would not get tired of him. Martin Scorsese is awesome, I'd love to chat with him! Haha, Edward Burns would be very interesting to interview! I must get onto those films of his. 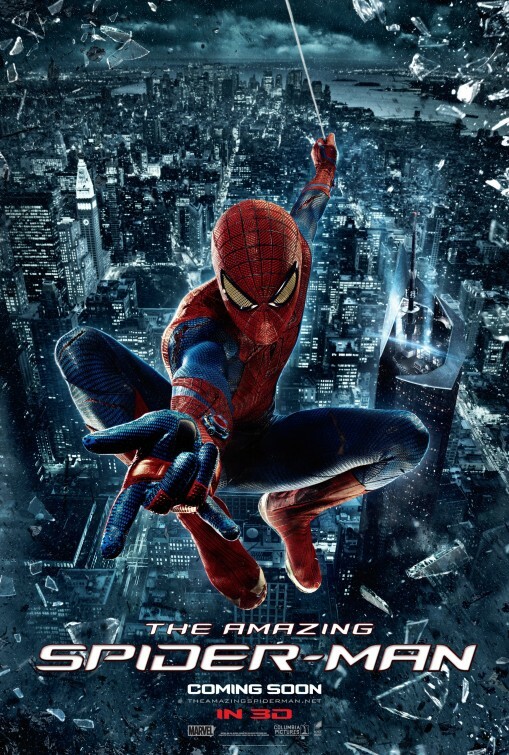 I really enjoyed both Spider-Man and Attack The Block, hopefully you will as well. I would like to interview Sam Mendes. I have really liked everything that he has done. He makes interesting, and beautiful films. I would like to pick his brain for a bit. Not to mention, I am jacked to see Skyfall! I didn't love Spider-Man, but I did love Attack the Block. It was awesome. Sam Mendes is really awesome! And I can't wait to see Skyfall! For me, it would be Sofia Coppola. Obviously. Hope you enjoy Amazing Spider-man, is this a rewatch I take it? I love Andrew Garfield!! He's just sooo adorable and having seen him in person standing mere inches away from me I like him even more. Nope, first time. I thought it was okay, but ANDREW GARFIELD! He is so adorable. You were so lucky to be in the same room as him - I would faint! I agree with Anna. Scorsese all the way. Hmm...I'd love to interview Kiarostami. I have a feeling it'd be a very chillaxed interview. Also, Peter Jackson, just so I could chat with him about all things Middle Earth related. That reminds me, I must watch more Kiarostami! Ha, come to NZ in a few weeks, and you could meet him. NZ is a very chillaxed place so you could probably just go to his house for a cup of tea. Thanks for the link and let us know how Spiderman was, I might see it,too! I'd like to interview Steve McQueen and Cristian Mungiu, my two favorite directors right now! Spiderman was okay...I'll be doing a review later tonight about it.